只有plain flour and self-raising flour. I made the banana chiffon cake, it's just great! I haven't tried this one, since not easy to buy the Pandan paste in Canada. Can you make a 'Green Tea Chiffon Cake' as green tea becomes more and more popular now. Appreciated and awaiting your green tea chiffon recipe. thank you very much for the recipe. i tried making one but failed. i wonder is it because my mould is a non-sticking one. (because it appears yours isn't) what do you think? Yeah, the mould should not be non-stick one. Otherwise your chiffon cake won't keep its shape after being puffed up by heat. i have tried your recipe again and now my chiffon cake is nice and yummy. however my cake has lots of bubble holes in it... not as smooth looking as yours. do you have any ideas what the problem could be? and any tips in getting a nice looking cake out the tin after putting the tin upside down? many thanks i'm sure i'll be baking this cake all the time! When folding in the egg whites, make sure that you combine all ingredients completely, but not to stir vigorously. Chiffon cake would have some holes in it as long as they are not too many. After putting the tin upside down, let the cake cool completely before taking it out from mould. 下一步係學你嘅roll cake:) Thanks a lot!!! 還要補充一些資料, 在入爐15分鐘後將溫度調至150度, 但發覺蛋糕表面開始燶, 便在面頭加上鍚紙防燶, 這樣是否有影響呢? 是否在烘焗過程中一定不可以打開焗爐? 我的焗爐只有21公升,是否一開始就要先加鍚紙防燶,不要中途加呢? 雖然之前蛋糕沒有那麼高, 但味道一樣很好^-^, 下次我嘗試開始入爐時加鍚紙, 看成效如何, 多謝你! Hi Christine, I believe that many of your recipe has been copied to here without your notification. Please watch out. Thanks. Thanks a lot for letting me know. I left a comment there. Can I trouble you for an english version of this recipe please? Will do when I have time. I've tried your recipe today, the cake got following problems, can you please advice? 1) 当我倒扣在鐵架上待涼, 不到5分钟, 蛋糕就自然脫模. 为什么呢? 是那一个步骤做不对? 2) 发现中间比较湿 (especially near the middle tube), 为什么呢? like ur recipe alot! hope to hear from you soon. many thanks in advance! 3) 拌入蛋白霜的時候须要 incorporate a lot air? 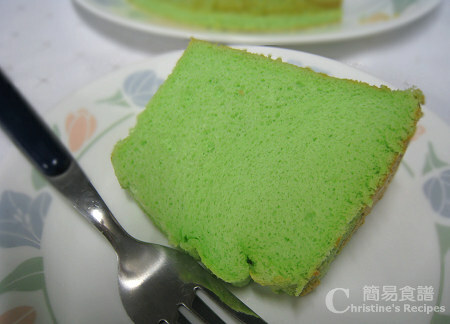 昨天看了masterchef的pandan chiffon cake, 心癢癢想弄一個. 請問在布里斯本那裡可以買到這種戚風蛋糕模? 你好. 上次試了你的japanese cheese cake, 成功了. 看完masterchef, 今天晚上終於試了你的食譜. 味道很好, 但中間下陷了, 不知道為什麼. 因為在brisbane找不到中空的模, 所以用了在kmart買的silicon loaf pan(長方形那種), 份量減了一半(除了蛋用了3隻, 2.5隻太難了). 呢個loaf pan surface係rough的, 不是很滑那種, 所以還是會黏, 我便塗了少少油. 打蛋白打了很久,反轉也不會流下,不過蛋白尖不算太挺立. 我打開焗爐,開了一吋, 再隔了2,3分鐘才拿出來倒扣. 油也不是塗了很多, 邊邊還是黏了, 倒扣也沒有滑下, 只是中間下陷了. 其實該用non-stick的模嗎? 看上面留言有點混淆. "mould should not be non-stick" 但又 "最好用不黏，不抹油的模". 我黎緊打算整呢個蛋糕, 睇了好幾遍你們的對話, 仲有d唔係好明,想了解清楚一點, 希望你能解答, 謝謝! 的用处？要分别吗？Can i Use Vege Oil Replace olive Oil? Yes, you could use milk instead, the smell is a bit different though. I have tried using a normal cake mould for the chiffon cake and I did invert it once it was baked, but it still shrinked a lot. is the normal cake mould really matter ? When it comes to baking chiffon cakes, the loose base tube cake tin is the best. The normal cake mould can do the job, but not too good to produce good looking chiffon cakes. Btw, did you grease your cake mould? If so, your cake will shrink and collapse very quickly. I am planning to try another time with 20cm normal cake tin with loose base, if it ends up shrinking like the previous one, I will buy the one specifically for chiffon cake. I would like to ask if the amount ingredients mentioned in your recipe still enough for the 20 cm normal cake tin ? And I didn't grease the mould but i did use baking paper to cover the base, so is it the reason that it shrinked? This recipe is for 8 inch/20cm cake mould. I think so, the baking paper would impact the chiffon cake. What help a baked chiffon cake from not shrinking back are the non-greased side and base, as the whole cake still sticks to the tin, so that it won't shrink too much. I have made another one with the cake tin and as expected it still shrinked in the middle. I follow the same way as the recipe except using plain flour. is it like ... using the mould with a hole inside can help to maintain the cake shape better ? I wana buy the chiffon cake mould now .. but i m currently in Sydney .... i don't know where i can find those like yyours in the photo? The tube in the middle helps the cakes easily be cooked through, also prevents the middle from shrinking back. The chiffon tube tin is the best for making this kind of cake. I got it from Hong Kong, Shanghai steet (上海街). Any chance you might go to Hong Kong, or ask some friends to get one for you? 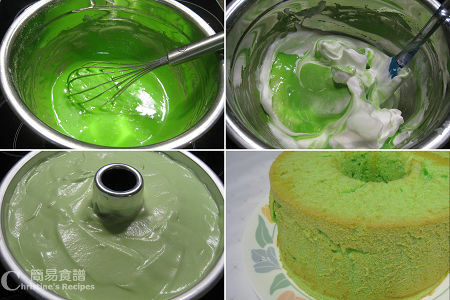 When I made this pandan chiffon cake, I just added 1 teaspoon of pandan paste, then the cake was very greeny, like the picture shown. 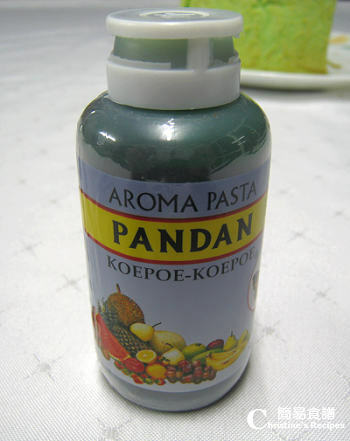 Guess that the pandan essence is only for adding flavour, and the paste has got the colouring. Seems that your cake still got some moist inside. You might try to bake a few minutes more next time, then your cake would be drier. Hi Christine, may I know if I can use a 9" mould instead of 8"? Many thanks! 唯有問題是, 當蛋糕脫模後, 蛋樣上面便被倒轉了, 放一會後便變得很濕. 不明白上面不是應該是最乾嗎? 為什麼經反轉後會變得濕濕的呢?? 我都想整一個以上的蛋糕,我想請問一下, 我的焗爐有Fan Oven功能並且指示焗蛋糕用200度焗40分鐘, 但照妳上面所寫是要170度15分鐘後改為150度, 那麼我是否先用200度焗15分鐘後改180度呢? 還是跟你所寫才對? 想問你有沒有試過用silicon 的bundt pan 來焗chiffon cake? Can we use pandan paste to make muffins? If so how much to make 6 muffins? 上星期日, 試焗班蘭旦糕,焗了35分鐘,用竹籤插過旦糕, 都沒有東西黏著, 就拿了出焗爐倒扣,等了一會,好心急地,未涼就脫模,發現個旦糕面頭部份是濕濕的, 代旦糕涼了,依然都係面層部份濕濕地, 係咪未熟呢?? 我焗了一個失敗之作, 共焗了35分鐘, 竹籤插過亦沒東西黏貼,但倒扣了一會,未完全涼,我就脫模, 太心急了,仲要即刻試味,味道是ok,但不知為何旦糕面有一部份濕濕地,反而低部就熟, 以為是未完全涼透, 但代涼透後旦糕面仍然是有一部份濕濕地,是否旦糕未熟呢?